Kite Festival - A Unique Concept! Embraced in a unique concept, the Kite Festival is one of the famous festivals of the pink city Jaipur. It is held on 14th January on the occasion of Makar Sankranti. This day is officially for kite flying. This delightful festival holds interest of not only the young generation but also the people belonging to different age groups. Be it a school going boy or an old man, everyone enjoys it. On the day of the Kite festival the sky of Rajasthan is full of colorful kites. It appears as if people have painted their vibrant imaginations on the canvas of the sky. People dedicate the entire day of Makar Sankranti to flying kites. Participants of the festival compete with each other and strive to take their kites to great heights. They try to cut each other's kite. You can hear people shouting when the kite of the opposing party is cut down. On this festival, the terrace of the house becomes the venue for celebration and along with kite flying, people enjoy great food and music. The festival is celebrated in manner in different parts of the city. The Government of Rajasthan organizes the Kite Festival in every five years at the Jaipur Polo Ground. It is a three day celebration. The ground gets packed with participants and the spectators who flock to this ground for entertainment. Talented kite fliers show their expertise in flying kites. Special kites are made for this occasion. Some are as large as 1.5 km made in mind blowing designs. The drawings on the kites touch various themes such as social message and cartoons. 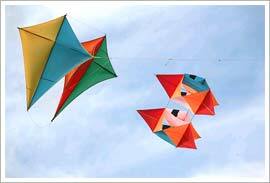 You can also participate in kite flying competitions as they are held at many places in the city.